Today, June 29th, 2014, is the seventh anniversary of the founding of this blog, which was begun on the Feast of Sts. Peter and Paul in 2007 by Anselm and myself. Even that founding was in a sense a re-founding, as I had originally launched Unam Sanctam Catholicam back in 2004 on the ancient blogger platform with some posts about morality and one about Chesterton. But as I did not have a lot of time and as blogs were fairly new back then, I let it linger for three years until Anselm turned me on to traditionalist Catholic blogs by introducing me to the New Liturgical Movement and Athanasius Contra Mundum. To date, this blog has 972 posts, and the sister site close to 500, which have together been visited 810,000 times. Deo gratias. The first, I will most likely be in seclusion for the next month or so. I have a lot going on in my personal life and may not get around to blogging as much. Maximus and Noah will no doubt have some posts, but probably not so much on my end, especially on the website, where posts are of a little bit greater depth. I still have a few things I may throw out that I have been working on, but in general I have to devote some time to my "real" life for the next month and will be on here only sparsely. 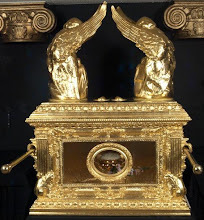 Second, and perhaps more exciting: In the introduction to this post, I mentioned the blog of Ryan Grant, Athanasius Contra Mundum, which went defunct in Easter, 2011. This blog was a wonderful resource of scholarly traditionalist thought and was instrumental in persuading me to take up blogging. He actually really established this blog's first readership by linking to an article I did on St. Louis IX; that was the first of many links from traditionalist blogs and sites that helped establish the reputation of USC. Over time I made the acquaintance of Mr. Grant and he even invited me to contribute to his site, which was a blessing. Several of Ryan's articles have been republished on the USC sister site (see here, here, here and his work on Sedevacantism here). Ryan did not disappear after the closing of ACM; he posted for a time on Distributist Review and briefly surfaced again last summer on the wonderful but short lived experiment in professional traditionalist apologetics, the now defunct Faithful Answers. 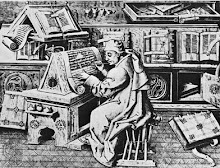 I am happy to say that after a three and a half year hiatus, Ryan has returned to the blogosphere with a full relaunch of Athanasius Contra Mundum. The new Athanasius Contra Mundum, available here and this time on a Wordpress platform, retains several stylistic elements of the old site but with the greater versatility offered by Wordpress. I have to warn you, there is not a ton of content on the site yet, but Ryan assures me that things will be moving on quickly. We rejoice at the return of Ryan Grant to the Catholic blogosphere and look forward to more good things to come from Athanasius Contra Mundum. Special thanks also to Noah, Maximus, John, Thrownback, Anselm and all contributors, as well as Rorate Caeli, Catholic Faith in Light of Tradition, Veneremur Cerui, Popin' Ain't Easy, and Phil Blosser who faithfully link to this site from time to time. 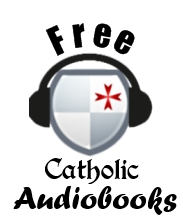 Special thanks to our partner in providing audio resources for traditional Catholics, Alleluia Audio Books. Apologies if I am forgetting anyone. May the good Lord bless us and have mercy on our souls, and may the great Saints Peter and Paul, whose spilling of blood established the double-apostolic origin of the most Holy See of Rome, intercede for us and for Holy Mother Church. Petrus et Paulus, ora pro nobis! Superheroes sure have become popular today. Our superheroes today, whether they are mutants, aliens, the ultra-rich, or genetically engineered whatevers, seem to be similar to the Greek gods more and more. One of the interesting things that many of our modern heroes have are veiled identities. Even though they are the same person, their mask in a way seems to not only amplify their character, but is a source of power to them. When appearing in public, the mask becomes a remembrance of their past great deeds, as well as a source of fear to their enemies. Our hearts race with affection and our minds are captivated by the tension introduced between the mask and the wearer. I have probably already given away where I am going with this. Has God prepared the human heart to love something hidden? I think so. Let's look at how a real God desires to spend His time amongst men: hidden but present under the appearance of bread and wine. The Faith in which we see our God in Holy Communion amplifies His character, humility, long suffering, meekness, and perfect charity. Are we captivated by the mystery of Him in Holy Communion? When we see the Corpus, do we remember His great past deeds? Superheroes fight their enemies, they even occasionally sacrifice themselves to save others from death. Our Lord, however, gave Himself up into the hands of those who hated Him; He suffered and died for us while we were still His enemies. Everyday He continues to offer Himself to His enemies (those priests and laity who receive Him unworthily in Holy Communion) so that He can feed the few faithful. Is there less fervor because He doesn't sweep in and save like a superhero? There shouldn't be, as He has used His mighty power again and again throughout history. In both of these instances, our Lord's dramatic action was to save this unfortunate woman and tempted priest from committing horrible sins. There are more stories in our new audiobook on ancient miracles of the Blessed Sacrament that surpass the power of a superhero. The difference, though, is this: Our Lord is animated by a desire to save our souls, while the subject of our cinematic heroes most of the time centers around saving our bodies. I think one story from the new audiobook illustrates this particularly well: one of a priest and his two altar servers. The altar servers are favored by a mystical visit from the Christ Child regularly whom they share their small lunch with, after several of these visits complain to the priest that the Christ Child never brought food to share. The Priest upon hearing this tells them to ask the Christ Child if they could all dine with Him at His Father's House. When the boys relay this request to the Christ Child, Our Lord became very happy and told them the date at which they would all dine together. Needless to say after celebrating Mass on that day, the three companions while having their heads bowed in prayer, died a most happy and peaceful death. Superheroes in our movies can perhaps delay our deaths through saving us from disaster, but they do not conquer death like Christ. Perhaps that is why the world loves superheroes so much, because the modern superhero's mission is to of prevent death. Death, the thing that mankind with a guilty conscience fears so much. You and I, dear reader, have been called to a greater mission than saving the world: to join with Christ in saving souls; we must assist in saving souls from eternal death. To save our life we must lose it, to become godly heroes we must not embrace ourselves, but Christ. Modern superheroes might be more and more resembling demigods, but you and I every day can more and more resemble the true and living God. O Eucharistic Heart of Jesus, Make Our Hearts Like unto Thine. This weekend my mother attended a Corpus Christi procession at a parish that is not her regular parish. She passed on to me the booklet the congregation used for the procession prayers, a composition called the "Litany of Lament for Sins Against the Body of Christ." As I read the prayers, I soon realized that these prayers were of such banal hilarity as to merit being the subject of a post. I should note, this came from a parish that is not known as a particularly progressive or dissenting parish; this is just your typical EWTN-watching, Fr. Barron-loving, Medjugorje-affirming fairly orthodox parish from American Novus Ordo Land. I have omitted the customary prayers at the beginning of the litany (the "Lord have mercy, Christ have mercy, etc). I present, the "Litany of Lament for Violations Against the Body of Christ", followed afterwards by my comments. For those times when we have failed to welcome the stranger or have been silent about immigration reform, Lord have mercy. 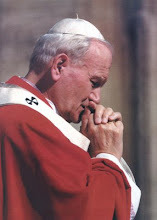 For silence by too many members of the Church while fifty-five million lives wee lost to abortion, Lord have mercy. For those times in our history when we have not spoken out against slavery, segregation, or persecution, Lord have mercy. For those times and in those places we have ignored those in prison and the needs of their families, Lord have mercy. For ignoring genocide in our world - by starvation, by brutal atrocities, and by civil and military actions, Lord have mercy. For the sins of Church ministers who sexually abused children, Lord have mercy. For the failings of those in hierarchy who failed to remove offenders from parish positions, Lord have mercy. For all those times when any of us has failed to protect children, Lord have mercy. Let us pray: Lord, we worship you living among us in the sacrament of your Body and Blood. May we offer to our Fathers in heaven our solemn pledge of undivided love. May we offer to our brothers and sisters a life poured out in loving service of that kingdom, where you live with the Father and the Holy Spirit, one God forever and ever. Amen. For those times when we have failed to reach out to families who were experiencing difficulties, Lord have mercy. For too quickly judging divorced and separated spouses, Lord have mercy. For our failures to reach out and support mothers and fathers considering abortion, Lord have mercy. For failing to use our resources to help the poor and unemployed, Lord have mercy. For failing to feed the hungry, clothe the naked, and shelter the homeless, Lord have mercy. For those times when we have ignored the gifts of our youth and their contributions to the Church, Lord have mercy. For all those times when we ourselves have failed to be instruments of reconciliation, Lord have mercy. For not fully utilizing the gifts of women in the Church, Lord have mercy. For being uncivil in our disagreements about liturgical practices instead of uniting in worship around God's altar, Lord have mercy. For those times when we have caused other members of the Body of Christ to suffer, Lord have mercy. For perpetuating historic divisions among Christians, Lord have mercy. For not recognizing our shared heritage with Orthodox and Protestant believers, Lord have mercy. For those times when we have been intolerant of non-Christian believers and to those who profess no faith, Lord have mercy. For those who own businesses, may they be good stewards of their gifts, Christ graciously hear us. For employees, may they reflect the Gospel of Jesus, Christ graciously hear us. For those who frequent the businesses, may they be bearers of truth, Christ graciously hear us. For those who visit, may they see the light of Jesus shining all around them, Christ graciously hear us. For our public officials, may they act according to the wisdom of God, Christ graciously hear us. For our utility workers, may they persevere in joyfully serving the community especially in emergencies, Christ graciously hear us. For all social workers, may know the peace of Christ, Christ graciously hear us. For all school teachers and principals, may they reach the children they teach emotionally, spiritually, and academically, Christ graciously hear us. 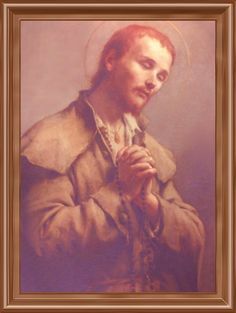 Let us pray: Lord Jesus, on the night you told us to take and eat your Body and Blood, you prayed to the Father that we may all be one as you are one with your Father. We too pray dear Jesus that we may all be one as you are one with the Father. Amen. First and foremost, was there anything in this entire litany about the actual, sacramental Body and Blood of Christ, which is the whole rationale for the feast? No. 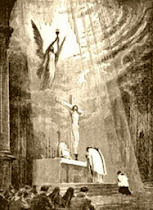 Never is the presence of Jesus Christ in the Blessed Sacrament mentioned, except for one vague allusion in the prayer "Lord, we worship you living among us in the sacrament of your Body and Blood," and the presence of the phrase "living among us" renders this prayer extremely questionable - as if we cannot worship the sacramental Lord without doing so mediately through the community who receives Him. Second, I also noted that every intercession, without exception, is entirely worldly, focused on this side of heaven. No prayer for those in the hour of death. No prayer for the conversion of poor sinners. No reparation for offenses against the Sacred Heart or our Eucharistic Lord. No prayers for the poor souls in Purgatory. No prayers for the salvation of the non-believer or for the Church's missionary efforts. Whoever composed these prayers evidently envisions the Church's mission as completely earth-bound, about speaking up for immigration reform. Third, it should be evident that the presence of Pro-Life sentiments is no longer and indicator of orthodoxy. Perhaps this was once otherwise; maybe back in the 80's and 90's. But the Pro-Life standard has become so ubiquitous within Catholic parish life that it has become kind of disconnected from any larger orthodoxy. This same litany which laments the holocaust of abortion and prays for mothers considering abortion simultaneously prays for greater recognition of the "gifts of women" in the Church (we know what that means), suggests that arguing about liturgical matters is "uncivil", and laments that we are "intolerant" of other faiths. In other words, we have reached a place where Pro-Life sentiments coexist comfortably with progressive theology. Being Pro-Life is no longer an indicator of legitimate Catholicism, and it can be arguable that it never was (related: Profile of a Theological Liberal). Fourth, the incredible naivete! This "Litany of Lament" bewails the fact that there is not enough influence of women in the Church, that we are too intolerant, that our problem with Protestantism is that we have not sufficiently affirmed it, that we are too judgmental about divorced Catholics. So, women don't have a big enough role in the Church? Maybe whoever wrote this prayer has not seen some of our diocesan publications, or has never Googled "Director of Religious Education" on Google Images, nor Googled images for "RCIA Director" - or for that matter, "Director of Faith Formation" or "Parish Administrator". Can anyone who has spent one year in a modern Catholic parish and done these basic image searches really be serious that women are not represented enough in the Church today? That the Church has not been sufficiently pro-illegal immigration? That divorced Catholics are treated too harshly? These people are living in fantasy land. But, as has often been pointed out, the solution for the problems caused by liberalism is more liberalism. Catholics obviously think of the Church as merely an institution for the betterment of society - and when the Bishop of Rome says things like the greatest crisis facing the modern world is youth unemployment and then skips out of Rome's Corpus Christi procession so he can make a pastoral visit to a Calabrian prison, the situation is definitely not made any better. By the way, I also noted the "Litany of Lament" did not include any prayers for the Pope. We could go on, but why bother? Or, to put that more specifically, there is no real vocations crisis. Certainly, there is a shortage of men seeking the priesthood, but the reasons for this are artificial and contrived. 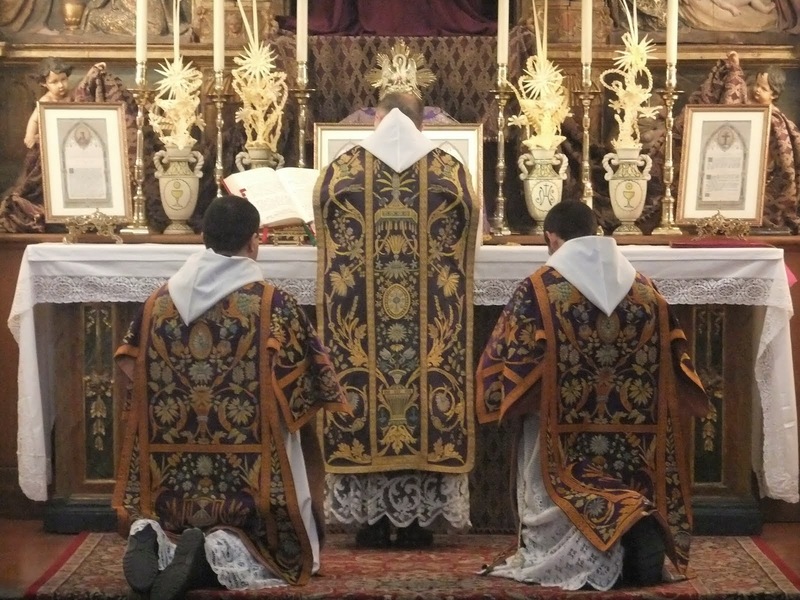 Priest shortages occur because Catholicism is being perverted, and when the idea of the Church is perverted, the role of the priest is obscured - and why would anyone want to join the priesthood when its purpose is not understood? This is why the biggest priest shortages are in those dioceses where the liberal cancer is strongest - yep, I'm looking at you, Britain and Austria. Now, please take a moment and read this article in its entirety. These two tiny little towns have produced 80 nuns and 44 priests - and the two towns combined only have a population of 2,162! Now I know all those vocations happened gradually over the years, but just for giggles, if we do the math and divide the number of vocations by population, an astounding 5% of the population of these two villages enters priesthood or religious life. I know the statistic is not accurate, but you get the point; getting 44 priests out of two dinky towns in the post-Vatican II period is simply amazing. The Diocese of Lincoln has nothing on Fowler and Westphalia! "The houses in these two villages eight miles apart in Central Michigan are orderly, with Virgin Mary statues in front yards, American flags on front porches and unlocked front doors. Faith is the center of life, those who live here say: Everyone is Catholic, everyone is related and everyone shows up at Mass. The youth groups are active. Nearly all the students attending the prom in the villages begin the festivities by attending a regularly scheduled 4:30 p.m. Mass, dressed in their party attire. The only grade school in Westphalia is a Catholic one, and the only place of worship is a Catholic church, St. Mary’s, pictured in the city logo alongside the water tower." "Most Holy Trinity hosts a weekly prayer hour dedicated to religious vocations and an annual fund-raiser to help cover tuition." Folks, the vocations crisis is not real and has nothing to do with Catholicism per se. It has to do with a falling away of Catholicism, a rejection of Catholicism. When Catholicism is eagerly embraced and allowed to become part of culture - when it is the center of family and civic life - vocations flourish, as the examples of Fowler and Westphalia show. Imagine if this sort of thing could be reproduced in hundreds of small towns throughout the Catholic world. If we would just live our Faith - and if our leaders and clerics would just embrace the Truth - the vocations crisis would be over instantaneously. "Pray to the Lord of the harvest to send out workers into His harvest." The Lord raises up workers for His harvest. When the harvest is no longer His, or when they work for someone other than Him, He will cease to raise up laborers. Return to the Faith, and the Spirit will do His work. "'Return to me and I will return to you,' says the Lord." (Mal 3:7). We can never repay our Fathers enough for their cooperation with God in giving us life. No matter how we were conceived, or even their shortcomings in raising us, without them we would not exist. It is a point worth repeating from a previous article on motherhood, that God put the 4th commandment above the 5th for a reason. In Gods eyes, it is a more hateful thing to have contempt for those who created you, than to kill a man, because without being created you would not even exist to make decisions. Throughout history mankind reverence for Fathers even extended beyond just paternal fathers. In the times of chivalry, a Knight was not allowed to meet in combat the Knight who had trained him (often times this was not the paternal Father as the Father would try to find the most distinguished Knight to train his son in warfare). Even St John Climacus in the Ladder of Divine Ascent, one of the great ascetical works from the early church, took this point to excess when he said it worst to offend our spiritual father than to offend God (his reasoning was because our spiritual Father made intercession for us before God). How does a little boy show love for his Father? By obeying him, learning from him, following his examples, being courteous to his friends, speaking like him and admiring his various perfections. An older son carries the name and beliefs passed onto him (in the name of God) and strives to not shame him from departing from the instruction and good example that his Father has given him. An adult Son seeks his advice, shows him attention, cares for him in his needs and speaks well of him to others and passes down the wisdom that he has received from him to his children. That does not mean that the son will be a copy of the father, no Father would want a copy but rather he would want the son to be more excellent and a better man. In becoming a better man the son gives a great honor and reward to his father for his labors in raising him. Our greatest joy was when onto us a Son was born. The best example we saw was a Son doing the will of His Father. Our whole reason for hope in salvation is because of the Love that the Father has for the Son and the Son for the Father. Can a world that does not love and respect their Fathers, learn to call upon God as a Father and love and respect him, no. Can a person be saved who does not honor their mother and father, no. We can say beyond a doubt that a world that does not respect its fathers, does not respect God the father, and is going to hell both literally and figuratively. But my dearest friends, we are the adopted sons of God. 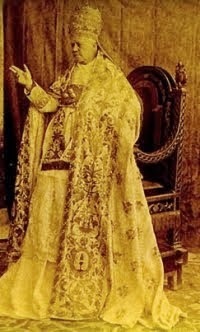 Who amongst the just is not humbled to call the holy patriarchs, prophets, apostles, saints, our fathers in faith. But God has called us His Sons. The confused world holds Gods law and our Fathers confession and service of him to scorn and contempt. These reeds are so shaken in the wind that they even condemn what they said yesterday let alone what our Fathers said even less than 20 years ago. Is it any wonder that there are so many sad songs, so much rebellious rage mixed with tearing fear. They have neither a refuge in God, their parents, nor the memories of the days of old, while Christians have a refuge in all three. It is easy sometime as society continues to grow darker to think that we are isolated and alone. No society has lasted long that has thrown off the natural law, and when we ignore the stories past unto us, history will repeat itself. 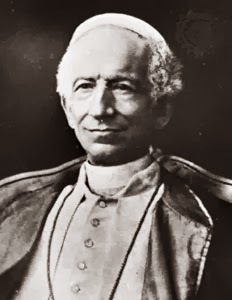 Do not be shaken in practicing the faith of our fathers no matter how many brazen impiety, dimwit novelties and stupid theological nuances seek to destroy the faith passed on by our fathers to us. As God did not condemn our Fathers who were faithful then he will not condemn those who are faithful to what they received. As God did not leave the Apostles orphans he will not leave us, also his children, orphans. We are in good company when we stand with our fathers before us confessing that Apostolic Faith which has always been and always will be victorious. March 13, 2013 is a day I will never forget. I was at work, but being that I am graced to work with mainly Catholics, we had pretty much ceased all productivity for the afternoon when we saw the white smoke come out of the Sistine chimney. We were all gathered about the office computer watching the bad-resolution live feed and waiting for the appearance of the new Pope on the loggia of St. Peter's. We were all hoping for Burke or Ranjith and predicting what regnal nomen the new pope would take. 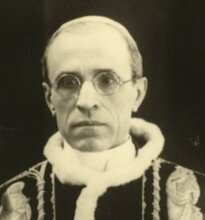 Then Cardinal Tauran appeared and announced the new pontiff. I could not understand him, but I made out the words "Francisco" and "Jorge", which I knew meant "George", so for a moment I thought he said Francis George. Then Jorge Bergoglio stepped out onto the loggia. Overwhelmed by the applause and the intensity of the moment, he just stared off the balcony with a thin, weak smile, sweat visibly rolling down his cheeks. He awkwardly waved and continued to stare as the commentators attempted to do some hasty research and explain who Jorge Bergoglio was. I consider myself a Catholic who is fairly well educated about the Church at large, but I had no idea who Bergoglio was. I had never heard of him and certainly did not recognize his face. He was a nobody to me. A complete blank slate. I had no opinions about the man for good or for ill. Yet, strangely, when I first saw the new pope, a terrible, ominous feeling came over me. A feeling of...well, not dread, but a deep, heavy and oppressing sense of trouble - foreboding. In fact, my stomach kind of sank and I felt sick. This reaction was a mystery to me then and continues to be so now; I was a college student in 2005 when Ratzinger was elected, and when Ratzinger walked out onto the loggia, I was filled with jubilation and joy - even a supernatural sense of filial devotion and piety which I noticed fill my heart when Benedict XVI was introduced. And at that time I knew very little about Ratzinger, either. Such a contrast between the two conclaves! I was again expecting 2013 to be a conclave of joy, like 2005 - but I was very disoriented and troubled when Pope Francis was announced. Everything just seemed...under shadow. I thought this was just my own private reaction, but over the past year I have heard countless stories of people sharing the same anecdotes. Common phrases to describe that moment are "ominous", "foreboding", "sinking feeling in my stomach", "sick" and so on. I have been honestly shocked at how many people I have run across who explained feeling a similar sensation on the eve of the Holy Father's election. It seems to be something of a phenomenon. I know feelings don't necessarily mean anything, and I do not want to read more into this than what there is. But I am now curious, did you have a similar experience? 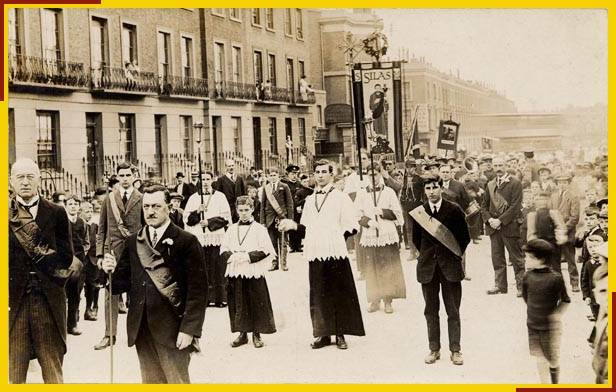 How widespread was this premonition of foreboding among traditional Catholics? 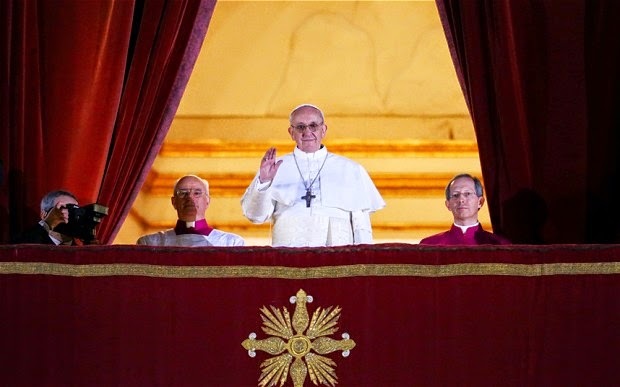 When Jorge Bergoglio stepped out onto the loggia for the very first time on that drizzly evening in 2013, what was your initial gut reaction? Before you knew who he was - before you Googled his history - before he had time to do anything for good or for ill - before you had time to think about what he was or was not wearing on his gestures or anything else - what was your initial, from-the-belly reaction about the new pope? I am not asking you to bash Pope Francis or offer commentary on anything that has happened during his papacy; I am merely asking you to think back to March 13, 2013 and recall how you felt when you saw the new Pope for the very first time. Leave your stories in the combox. I don't usually ask this, but in this case, please restrain your comments to answering the question I have posed. If you are old enough, please feel free to add comments about your reactions to other papal elections as well.